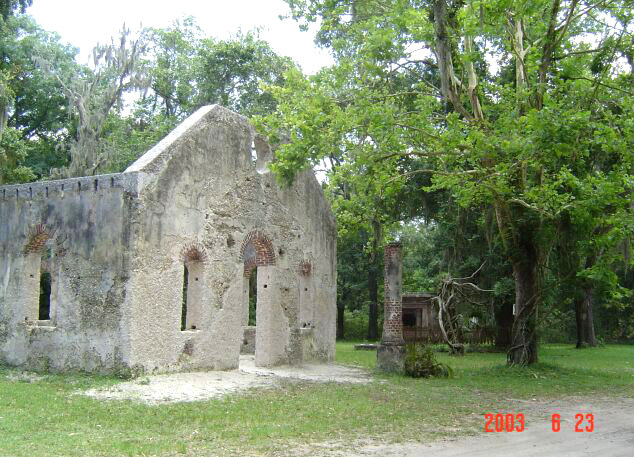 The chapel, known as the "White Church", was built during the period 1740 - 1747 for the Episcopal parishioners of St. Helena Island. It was constructed from brick and tabby, a local cement mixture made from lime, sand and oyster shells. It is believed that this form of mortar was used by the Moors of Morocco before they invaded Spain. The Spanish then brought this method to the shores of what was to become South Carolina. Money was donated by the planters, including John Fripp III who left £500 to the chapel in his will dated 27 Jul 1780. The chapel service was interupted on the morning of Sunday, 4 November 1861, when a message was delivered to Captain William Oliver Perry Fripp to warn the parishioners of the nearby Union invasion that would bring the Federal occupation of Beaufort. Another large contributor was Edgar Fripp (1806 - 1860), who owned the 944 acre "Seaside Plantation" on South East centre of the island. 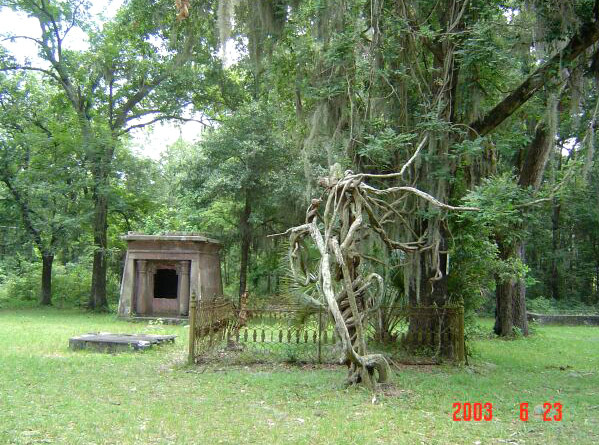 He had a mausoleum constructed in 1852 for himself and his wife Eliza Fripp, who both died in 1860. A third space was left vacant, possibly intended for his brother, James. 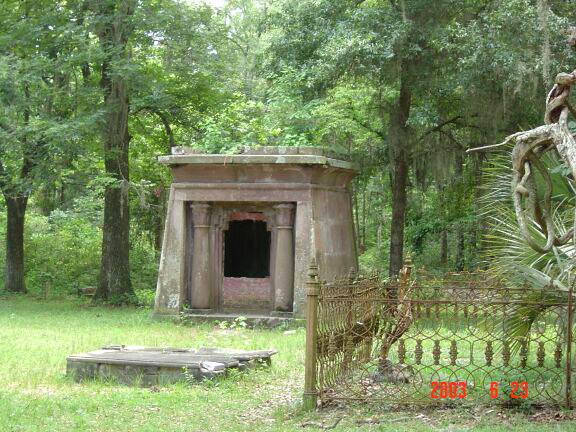 The mausoleum was constructed by W.T. White, a stonecutter from Charleston. Edgar and Mr White were observed in the churchyard on 13 April 1852 by the diarist, Thomas B. Chaplin, who owned the "Tombee" plantation. He added a note to his diary entry in 1876 as follows: "Said vault was a fine affair and did not have to wait very long for it's occupants, Edgar & wife. The Yankees broke it open during the war hoping for treasure. It is now somewhat out of order." Edgar also owned a large house in Beaufort, named "Tidalholm", which was thought to have been constructed about the same period as the mausoleum. The house still exists and has been used for film locations. Vicki describes the empty vault as pretty scary. Looking down through the opening there are 3 red brick horizontal crypts, about 5 or 6 ft. deep. There is a marble tombstone look-a-like on the back wall of the mausoleum, but nothing on it is readable. A stone at the base reads 1852. The grounds are reported to be haunted. One story tells of attempts to seal up Edgar's mausoleum, only to find the bricks removed overnight and stacked in a neat pile. Others have reported strange lights in the area. The chapel was the only place of worship for the islands planters until 1855 when a larger Baptist Church was built just to the North in 1855. This was known as the Brick Church and is now contained in the Penn Centre. 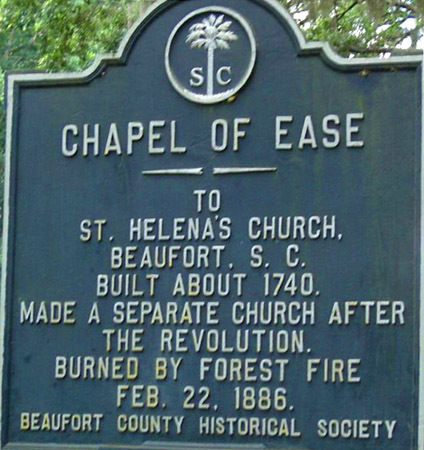 The chapel was severley damaged by a forest fire in 1886, and the ruins are now owned by the St. Helena Episcopal Church in Beaufort. Maptech Map showing location of the Chapel ruins and the Brick church. Penn Center Map of the Penn Center with photo of the Brick church. Tabby More about Tabby, the local cement made from sand, lime and oyster shells. Tidalholm Photo and details of "Tidaholm", Edgar Fripp's summer home in Beaufort.